The finest handmade stringed instruments for Mariachi and Latin Music. Imagine the songs that are just waiting to come out this guitar! Made in the legendary mountain village of Paracho, high in the Sierra Madre Mountains of Mexico. Paracho artisans have been perfecting their craft for over 200 years. With its beautiful handmade 3-⅛ single cut body, solid cedar top, gold hardware, pearl tuning pegs, tortoise shell binding, and soft satin finish make the San Benito a joy to play! The Native American bead art rosette complete this sharp looking guitar. You wont want to put this one down! The handmade traditional 3-⅛ body style, solid cedar top, gold hardware, pearl tuning pegs, and tortoise shell binding make the San Marcos a joy to play! This guitar ready to be your new work horse! The El Paso’s handmade single cut body, solid spruce top, hi gloss finish, abalone inlaid rosette & binding have to been seen in person. This guitar sound just as pretty as it looks! The handmade traditional body style, solid cedar top, and tortoise shell binding make the Llano a joy to play! The Native American bead art rosette complete this guitar. The Paracho Elite Del Rio Requinto is a notch above other instruments with its solid cedar top, nice sound hole and binding treatments. The requinto guitar is a six-string nylon guitar with a scale length of 530 to 540mm, this is about 18% smaller than a standard guitar scale (650 to 655mm). Requintos made in Mexico typically have a deeper body than a standard guitar (110mm as opposed to 105mm). Requintos are tuned: A2- D3-G3-C4-E4-A4 (1/4 higher than the standard classical guitar). In Mexico, the requinto is typically used in a trio romantico , which includes the use of two other guitars along with the requinto. Many of the Paracho Elite luthiers are fourth and fifth generation musical instrument makers. These hand crafted, quality guitars are made from some of the finest woods. Most importantly, they produce remarkable sound and are played by recording and performing professionals. The Paracho Elite Gonzales 6 String Requinto has dense mahogany for the back and sides, a solid cedar top and the heft and feel of a pro instrument. Other features include a nice soundhole rosette and binding treatments. With the mastery of an inlaid Abalone sound hole rosette and striped, double figured binding the Zapata uses all the right materials including sides and back of Italian-made simulated rosewood. The Vihuela is a small, deep-bodied rhythm guitar similar to the Guitarron. It provides strumming and double-stringed plucking rhythms and chordal accompaniment to the Mariachi ensemble. 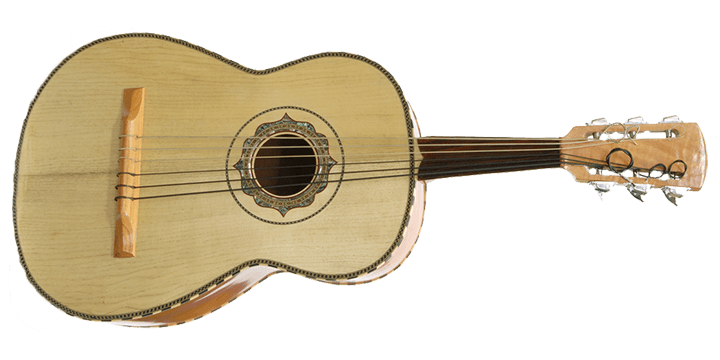 The Vihuela measures 31” high and 6-1/4” deep. It is available with a “Traditional” nylon tie fingerboard or a brass fretted fingerboard. It is tuned A-D-G-B-E, the A, D and G are tuned one octave above a guitar, giving the instrument a ukulele-like quality. • Geared machine heads Specify frets or nylon ties. The heart beat of Mariachi Music because of it’s soulful deep bass tone and humanic energy. The Guitarron (literally “large guitar” in Spanish) is a very large, deep-bodied Mexican 6-string acoustic bass played in Mariachi bands. One of the largest guitars in the music world, the 6 string Guitarron is 42” high with a large rounded back that measures 11” deep. It is tuned to A-D-G-C-E-A. The strings are often plucked in pairs to produce octaves. The Paracho Elite Alvarado bajo sexto guitar features beautiful Abalone inlay work consisting of small squares carefully butted together, color matched and polished. The rosette binding and generous side treatments make this a truly unique instrument. Catch those ears and eyes with striking sound and look of the Belleza. The Belleza features a beautiful handmade single cut body accented with pearloid inlay and Native American bead art rosette. Complete with a solid cedar top, two tone ebony and ivory binding, pearl tuning pegs, and a smooth satin finish. This instrument sounds as good as it looks! Players of Latin and Mariachi styles of music will recognize the Paracho Elito Bravo bajo sexto. With traditional styling it has features that are in demand by professionals. The solid cedar top’s warm tone is complemented by mahogany back and sides. The Bravo bajo sexto also features a rosewood fingerboard and “whale tail” bridge. The Paracho Elite Hidalgo bajo sexto guitar has a thinner body that is in demand by a lot of today’s players. The Hidalgo features a solid cedar top with a cedar back and sides. The natural top is paired with a stained back and sides while the satin finish allows the wood to sing. This professional Paracho Elite Moreno Bajo Sexto (HANDMADE IN PARACHO, MEXICO) is traditionally designed in all black finish double-figured binding and the signature cutaway. Black satin finish, Solid cedar top, Cedar back & sides, Rosewood fingerboard & bridge, Ebony & ivory striped binding Perfect for Banda, Corridos, Nortenos and Tex Mex! 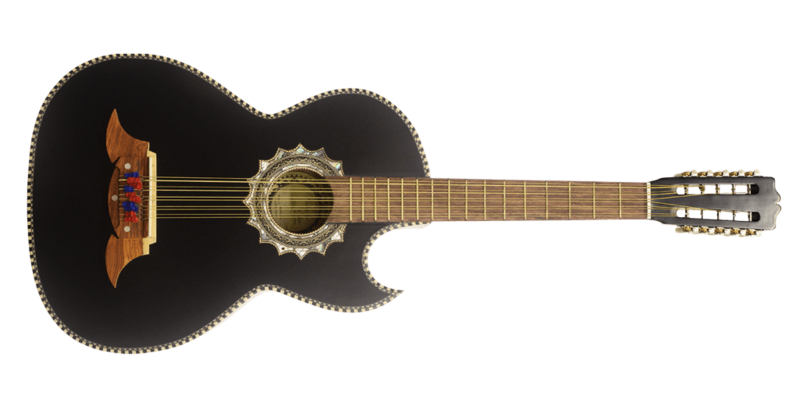 The Paracho Elite Presidio bajo sexto guitar features an abalone-inlaid rosette, double-figured binding and the signature cutaway. It also features a laminated rosewood headstock with an inlaid pearloid star. The solid cedar top’s warm tone is complemented by rosewood back and sides. Those playing the Latin, Mariachi and South American styles recognise the Victoria. The Paracho Elite Victoria-P 12 String Acoustic-Electric Bajo Sexto fits into any ensemble with tone and clarity. Beginning at position 1 (equivalent to the 1st string on a guitar or little E), the first two strings are tuned, in unison, to the note of F. The pitch is equivalent to the F note which is found on the 3rd fret of the 4th string on a guitar. At position 2, the next set of strings moving upward, both strings are tuned in unison to the note of C, equivalent to the C found at the 3rd fret of the 5th string on a guitar. At position 3, the next two strings are tuned in unison to the note of G, equivalent to the G note found at the 3rd fret of the sixth string of a guitar. At position 4, you will find two strings of different size. The smaller string is tuned to the note of D, equivalent to the open 4th string of a guitar, also found on a tuner. The larger string is tuned also to the note of D, one octave lower than the other string, which can be found on a bass tuner or simply tuned by ear, one octave lower than the smaller string. The Paracho Elite Morelia bajo quinto features a brilliant striped binding, pearloid rosette, and with an ebony satin finish. The Morelia sounds as good as it looks. The Paracho Elite Laredo bajo quinto has a brilliant striped binding and “whale tail” bridge. The Laredo has full bodied tone with a solid cedar top, cedar back and cedar sides. The striking dark natural top is paired with a stained back and sides while the hi gloss finish allows the wood to sing. Catch those ears and eyes with striking sound and look of the Novella. The Novella features a beautiful handmade single cut body accented with pearloid inlay and Native American bead art rosette. Complete with a solid cedar top, two tone ebony and ivory binding, pearl tuning pegs, and a smooth satin finish. The Novella stands above all other instruments in its class. The Paracho Elite Odessa bajo quinto has a brilliant ebony and ivory striped binding, Native American bead art rosette, rear facing pearl tuning pegs, and a hand carved “whale tail” bridge. The Odessa has full bodied tone with a solid cedar top, cedar back and cedar sides. The 12 string Tiple is associated with the Andean region of Colombia but is also found in other South American countries. The four sets of 3 steel strings are tuned to the same pitches as the treble strings of the guitar, with the middle string of the three lowest sets tuned an octave lower. The Havana Cuban Tres is strung in 3 pair or 3 sets of 2 strings. The Havana has an elegant soft shoulder cutaway, decorative rosette, and a clear gloss finish.